On the Arrive Alive website we find information and advice for our bikers and motorcyclists on how to improve safety on the road. To achieve greater road safety we should not only educate and encourage – but also evaluate! It is important to investigate and analyse the cause of crashes and to share this with the biking community in an effort to improve behaviour. We would like to share one such initiative that may benefit road safety amongst the biking community. With motorcycle accidents on the rise and loss of life ever increasing, a positive effort is needed. What will be interesting is to investigate the causes of these accidents, once the causes have been determined more can be done to minimise or eliminate serious injury and loss of life. Causes need to be addressed and action needs to be taken to truly make a difference. 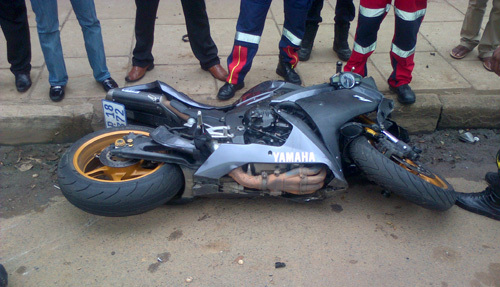 We therefore announce the launch of MASI (Motorcycle Accident Scene Investigations) and ask you to work with us. For now it will be done by skilled volunteers out of good-will and love for people, we first have to prove the necessity of such a service before it can be funded. It will benefit all parties involved (victim, insurance companies, road safety and skills development for both drivers and riders) present and future, these should be obvious. Through this lives could be saved. Collected data will be used to improve road safety, skill and safety awareness. Motorcycle accidents can be caused by various factors, from single to multiple vehicle; these factors are to be investigated. Factors such as speed, road surface and conditions, rider ability and skill, intoxication, fatigue, weather, visibility, motorcycle condition, other vehicles and road users, etc. are vital elements that need to be pointed out and reported on. Accidents result in injuries or loss of life, and our investigations will help prevent these by highlighting the cause factor. The wear of correct riding gear also plays a vital role in injury prevention; this too will be investigated and reported on. Accidents are reported to SAPS and insurance companies but very little or nothing is done to find the truth behind the incident and how it could’ve been prevented. A simple police report is not good enough to really make a difference with obvious benefits as a result of proper Accident Scene Analysis. Our investigations will become a powerful tool for safety and skill development. Hein Jonker, the Senior Instructor for Bike Talk MRA, will be heading this initiative and invite skilled motorcyclists and organizations to join him in an attempt to make a real difference. Contributing in any way is worth more than just saying "Well, just another accident. Condolences to the family. R.I.P." Hein Jonker hereby calls on people for assistance to report accidents promptly and accurately for the MASI team to quickly get to the scene before it becomes too contaminated. This initiative will be registered with all major insurance companies and the local authorities. The 921 on-scene, in-depth accident investigations have provided a large volume of data related to the general characteristics of Motorcycle accidents; including accident causation and rider and passenger injury information. The outcome of these investigations can be considered in the identification, development and introduction of countermeasures. 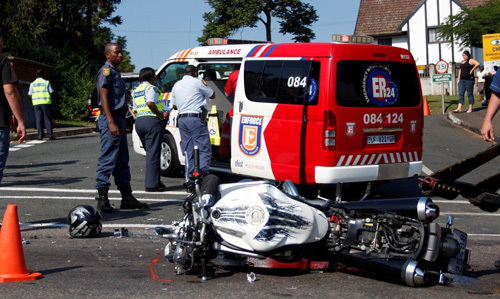 In 37% of cases, the primary accident contributing factor was a human error on the part of the Motorcycle rider.  In some situations, the human errors that occurred involved skills that were beyond those that typical drivers or operators might currently have. This is often due to the extreme circumstances of some of the accident cases, including an insufficient amount of time available to complete collision avoidance. Among the secondary contributing factors, Motorcycle riders failed to see the other vehicle (Other Vehicle) and they also made a large number of faulty decisions, i.e., they chose a poor or incorrect collision avoidance strategy. In 13% of all cases, there was a decision failure on the part of the Motorcycle rider. The number of cases involving alcohol use among the Motorcycle riders was less than 5%, which is low in comparison to other studies, but such riders were more likely to be involved in an accident. When the accident riders were compared to the exposure population, the data demonstrated that the use of alcohol increased the risk of being in an accident, although the percentage was lower than in other studies. Unlicensed Motorcycle operators, who were illegally riding Motorcycles that required a license, were also found to be at greater risk of being involved in an accident when compared to licensed Motorcycle riders. In comparison to the exposure data, unlicensed Motorcycle riders, illegally operating a Motorcycle for which a license is required, have a significantly increased risk of being involved in an accident. Motorcycle riders between 41 and 55 years of age were found to be under-represented, suggesting that they may have a lower risk of being involved in an accident when compared to other rider age categories. When compared with the exposure data, 18 to 25 year old riders were found to be over-represented. In 50% of cases, the primary accident contributing factor was a human error on the part of the Other Vehicle driver. Other Vehicle drivers holding Motorcycle licenses were less likely to commit a perception failure than those without a Motorcycle license, i.e., they did not see the Motorcycle or its rider. In about 1/3 of accidents Motorcycle riders and Other Vehicle drivers failed to account for visual obstructions and engaged in faulty traffic strategies. Traffic control violations were frequently reported, in 8% of the cases for Motorcycle riders and in 18% for Other Vehicle drivers. Amongst the wide diversity of Motorcycle accident and collision configurations that were observed in this study, not one configuration dominated. 90% of all risks to the Motorcycle rider, both vehicular and environmental, were in front of the Motorcycle rider prior to the accident. Among the primary contributing factors, over 70% of the Other Vehicle driver errors were due to the failure to perceive the Motorcycle. The roadway and Other Vehicles were the most frequently reported collision partner. In 60.0% of accidents, the collision partner was a passenger car. Tampering in order to increase performance was observed by visual inspection in 17.8% of all scooter cases. This value is lower than those reported in other studies. The exposure study only shows 12.3% of tampering. Only modified conventional street motorcycles were found to be overrepresented in the accident data. There was no evidence of an increased risk associated with riding any other Motorcycle style. There were Motorcycle technical problems in less than 1% of the accidents. Most of these were related to the tyres, illustrating the need for regular Motorcycle inspections by the owner. There were no cases found by the teams in which an accident was caused by Motorcycle design or manufacture. 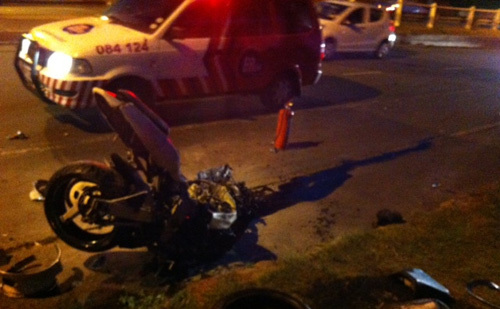 In over 70% of the cases the Motorcycle impact speeds were below 50 km/h. In 18% of all cases, Motorcycle travelling speeds were greater than or less than the surrounding traffic and this speed difference was considered to be a contributing factor. 73.1% of all Motorcycle riders attempted some form of collision avoidance immediately prior to impact. Of these, 32% experienced some type of loss of control during the manoeuvre. 90.4% of the Motorcycle riders wore helmets. However, 9.1% of these helmets came off the wearer’s head at some time during the accident, due to improper fastening or helmet damage during the accident. Overall, helmets were found to be an effective protective device to reduce the severity of head injuries. 55.7% of Motorcycle rider and passenger injuries were to the upper and lower extremities. The majority of these were minor injuries, e.g. abrasions, lacerations and contusions. Appropriate clothing was found to reduce, but not completely eliminate, many of these minor injuries. Roadside barriers presented an infrequent but substantial danger to Motorcycle riders, causing serious lower extremity and spinal injuries as well as serious head injuries. For Motorcycle riders, a roadway maintenance defect caused the accident or was a contributing factor in 3.6% of all cases. For Motorcycle riders, a traffic hazard caused the accident or was a contributing factor in 3.8% of all cases. Weather-related problems either caused the accident or contributed to accident causation in 7.4% of Motorcycle accidents in the study. The Motorcycle accident data collected in this study indicated that the object most frequently struck in an accident was a passenger car. The second most frequently struck object was the roadway itself, either as the result of a single vehicle accident or of an attempt to avoid a collision with an Other Vehicle. Whilst each sampling area contained both urban and rural areas, the majority of the accidents took place in an urban environment. Travelling and impact speeds for all Motorcycle categories were found to be quite low, most often below 50 km/h. There were relatively few cases in which excess speed was an issue related to accident causation.